Get Guest Posts Approved Immediately! There is an old saying, “You only get out of something what you put into it.” Well, let’s take a look at this saying as it relates to traditional guest blogging. First, you have to search for blogs on your subject that will accept guest posts. This can take hours. Second, you have to contact the site publisher to determine if they will accept a guest post from you. Within this request, you will have to provide an outline of your article. The time it takes to write this email, composing your request and writing a summary of your article, may also take hours if not an entire day. Third, you have to wait for the publisher to get back to you, which may or may not happen. The publisher will probably get back to you saying that they may publish your guest post but there are not guarantees. After all, they have not seen your article yet. Or, they may respond to you that your article is not suitable for their site at this time. This process can take days if not weeks. Fourth, if your article will be considered for the site, you then have to write your quality guest post and submit your guest post to the site. Now, of course, they may like your article and publish it or they may request changes to your article, in which case you will then need to re-write and re-submit your article for consideration. This fourth step some can also consume weeks. So, what do you get for this amount of work, which may have consumed the better part of a month? Perhaps one or two inbound links to your site in the resource box of an article? Folks, that’s too much time for the meager results that you get! When you look at the time that you put into it, versus the little you get out of it, it just doesn’t add up. Your quality time should be spent in writing the article. Publishing your guest post should not take forever! With the demise of article directories, guest blogging has become very popular. However, as established above, it simply costs you a lot and the investment doesn’t pay off. Ultimate Guest Blogger solves all of these problems. You simply need to do a portion of step #4 above and you are done. 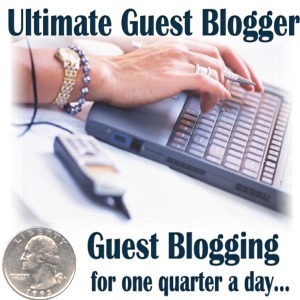 At Ultimate Guest Blogger, we believe that your quality time should be spent actually writing the guest post. Once you have done that, Ultimate Guest Blogger provides the platform for you to publish that article immediately. You do not have to find blogs that will accept your guest post, construct a clever email, wait for a response, revise your articles, and hope and pray that your article will get published. Once you have written your article, you simply use the easy Ultimate Guest Blogger interface and your post will appear immediately on one of our quality blogs on a website that is respected in the search engines. Well, there are cases where you put in lots of effort and receive little in return. Traditional guest blogging is one of those situations. After spending an inordinate amount of time, you receive one or two resource box links which may or may not be do-follow. Ultimate Guest Blogger allows you to actually get lots of return on your investment and we believe that your investment should be a well-written quality article. When you write an article for Ultimate Guest Blogger, it can can contain three do-follow, contextual links and it will be published immediately! That is how we reward guest bloggers who write great posts! 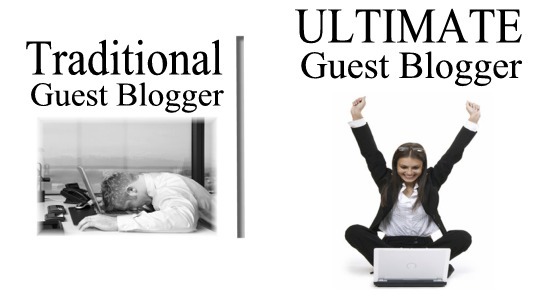 Ultimate Guest Blogger offers limited membership. Be sure to sign-up before all spots are taken!